Ian Power’s debut feature ‘The Runway’ will be on limited nationwide release from June 10th. IFTN caught up with writer and director behind the project to talk about the making of ‘The Runway’, casting children and the Irish film scene. The true story behind Ian Power's debut feature 'The Runway' is so charming, it is hard to believe that it survived over 25 years before inspiring a movie. In 1983, a Mexican Gulfstream II business jet came down in an emergency landing on Mallow Racecourse in Co. Cork. Captain Reuben Ocaña, the South American pilot of the jet became somewhat of a local celebrity for the five weeks he stayed in Mallow, as the locals came together to build a runway ensuring his safe return home. It is this memorable story that sparked Ian Power's debut feature film 'The Runway'. "I had seen it as a piece of news reel footage," explains Ian. "I was reading the newspaper at the time. I looked up and saw this really good looking Latin American in Ireland in 1983 in a small town. It was initially visually striking." 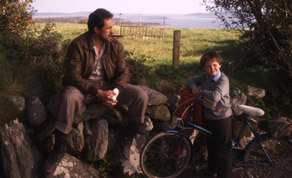 But as Ian continued to watch, the most inspiring story emerged in the footage, one that Ian felt was particularly Irish in its nature. "There was something really optimistic about it as well as being an interesting fish out of water story. I wrote it in 2007 when we were at the height of the Celtic Tiger and I had this niggling feeling that we had lost something. We were missing something about who we really are. This story seemed to capture the essence of who we really are and how great we can be. We are great underdogs. We can do extraordinary things when we seem to be most up against it." 'The Runway' centers around a young Cork boy named Paco (Jamie Kierans) who believing his absent father to be Spanish, learns elementary Spanish through tapes at night. When Columbian Pilot, Ernesto Cordoba, lands in the small village of Drumaleen, County Cork, lonely Paco forms a friendship with Ernesto as well as acting as a rather questionable translator. For Ian, he always wanted the film to rebel against the prevalence of more serious themes that have been dominant on the Irish film scene. "I think a lot of Irish films are made in a selfish way. Directors can always defend the film and say well you don't get it because you don't understand me and I never wanted to be able to defend the film by saying that. It's always about presenting it to the audience and letting them decide." And it seems the humour and heart in 'The Runway' is already winning over audiences having won Best Irish Feature at the Galway Film Fleadh 2010. Ian says he believes a change is afoot with younger Irish directors wishing to shake up the Irish scene. "My generation of filmmakers appear to be attempting to make more feel-good upbeat movies. If you do this, you start to look at having films compete on a global level and not just showing in Ireland to a small audience. Why can't we make Billy Elliot or The Full Monty?" It's Ian's directorial debut on a feature film, and his fifth attempt to write a feature script. "The great thing about Runway is that I knew straight away. I had a sense that this was a big one." Previous to this Ian had made several shorts which were very well received ('Dental Breakdown', 'Buskers') and had been directing commercials, a job he describes as "seductive": "It pays very well and you really learn your craft, but I knew I was not properly doing what I wanted to do." For the Irish viewer, the film reeks of authenticity, from the accents to the local vernacular and the inherently rural Irish setting of a sleepy village. Ian explains that this wish for authenticity was in the fore of his mind when casting the lead children. "I didn't want to have a kid from Dublin doing a Cork accent. I didn't want to have a kid being reminded that he's acting because he's putting on a voice the whole time." Having seen about 2500-3000 children, Ian narrowed them down to five children aged between ten and twelve. At this point in the casting process, Ian realised he had been targeting the wrong age group and began the whole search again. "The film is about an optimism. The main character (Paco) has a kind of foolish optimism, a naive optimism which allows him to do extraordinary things. Kids have this optimism until the moment they become adults which is defined to me by the moment they start to believe that everything isn't possible and the world isn't out to help you. So we had to start over and we looked younger this time, between eight and ten, and then we started to get the characters that we were looking for." So what was it about the young lead Jamie Kierans that caught his eye? "Jamie could talk about his character and the context of the film in the way that adult actors can. I felt that I would not have to orchestrate a performance from him, he could understand it. There is something more natural about it if the child can understand the character." The other central child in the film, John Carpenter (Frogs), was also a non-actor who only came to the auditions with a friend, hoping to get the McDonalds that was promised to him on the way home. "He was totally wrong because the character that I wrote was supposed to be this sort of clumsy fat kid and John is a really good looking fit kid," says Ian. It was only in meeting John Carpenter first-hand, that Ian says his personality and enthusiasm won him over. "I met him and we got the kids to act out scenarios that are a like the film, but not the exact same. I wanted him to act as if he had just witnessed a UFO and then tell me about it. He was doing it and it was good but I needed him to be out of breath so I said to him, he was standing beside me, and I said I want you to run over to that door and when I turned back from pointing at the door he was on his marks like an athlete and that was when he got the part for me. He was fantastic!" Having lured Demián Bichir on board with pre-funding script, Ian also nabbed upcoming actress Kerry Condon for the role of Grace Thomas. "I wanted to find somebody who was young and charismatic. The first draft of the script she was sort of stereotypical; the Latin love interest came in and he swooned her, and it always felt dishonest. I wanted to have a strong female part and the great thing about when I met Kerry is that she is a really strong woman. There is a sort of fieriness about her that I thought was instantly right but also a real vulnerability." But ultimately it was the chemistry between her and James Kierans which Ian felt was just right, as the Paco/Grace relationship in the film is one of close friendship rather than a traditional strict mother-son scenario. 'The Runway' was filmed on location in Schull, Co Cork before the foundation of the Cork Screen Commission which was launched earlier this year. Without the support of this commission and with a difficult shoot incorporating a runway, a plane, children and a bull, Ian describes the shoot as a "logistical nightmare." "But the actual place more than compensated for that," he continues. "The people welcomed us with open arms. They just made things happen, anything that we needed. They weren't hardened by films. In Dublin, sometimes you go to places and they've had people filming there before and someone smashed a window or did something. When you go on location you have a duty to other film makers so you don't go and burn bridges, you have to think that maybe someone else is going to have to come back here after. So you should leave the place as you found it." Earlier this year 'The Runway' was nominated for a whole host of IFTAs including Best Film, Best Director, Best Actress in a supporting role and scooped the prizes for Director of Photography (PJ Dillon) and for Production Design (Ray Ball). Ian says these gave the film a massive boost. "It was a huge thrill. I think he (PJ Dillon) did an exceptional job on the movie. Ray's win was phenomenal, he was up against The Tudors and to win in that category was just massive." Ian's options have opened up with the success of 'The Runway', a result that he welcomes. "There is a nice thing that I have an agent now out of this and people are starting to send me scripts which I hadn't banked on, you get so used to trying to generate your own work." Ian is currently working on a number of projects, including thriller set in London called 'Closed Circuits', and two other projects that are collaborations with other writers. "I don't know exactly what it will be but I will be making something next year." 'The Runway' is on nationwide limited released in Ireland from the 10th June and is distributed by Element Pictures. It will be screened in Cineworld, Movies @ Dundrum and Swords, Screen Cinema, Omniplex Santry, Swan Cinema , UCI Coolock and Vue Liffey Valley. Click here to view the trailer for 'The Runway'.